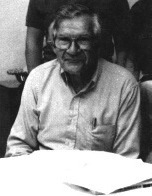 The late Austin M. Fox was an architectural historian and head of the English Department at Nichols School. During his rich life, Fox wrote extensively about the architecture and history of Western New York and the Niagara Frontier. In addition to three books, he had numerous features printed in Buffalo Spree magazine. He was also one of the editors of Buffalo Architecture: A Guide and editor of Erie County's Architectural Legacy. Additionally, Fox was a former chairman of the City of Buffalo Preservation Board and of the Landmark Society of the Niagara Frontier. He earned a BA from Union College and an MA from Harvard.